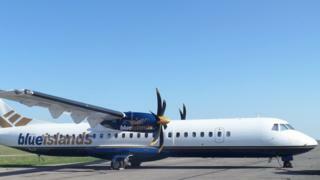 Channel Island airline Blue Islands will change its branding if it signs a franchise agreement with Flybe. Rob Veron, Blue Islands' managing director, said it would allow the firm to reach more people. Blue Islands will remain Channel Islands-owned but will operate in Flybe-branded aeroplanes and sell tickets through the Flybe website. Blue Islands will join Loganair and Stobart Air as Flybe franchise partners. If the agreement is signed the change is expected to start in May 2016 with customers already booked through the Blue Islands website travelling on the new Flybe service after May. Mr Veron said: "Whilst our aircraft will be re-painted in Flybe livery, we will still remain an independent, locally-owned air operator continuing to fly all our own aircraft. "We will continue to employ all our own crew, undertake all our own maintenance and control our own handling arrangements, and set our own prices." Blue Islands is a Channel Islands-based airline, flying between the UK and the Channel Islands, and has been operating since 2006.